Handmade kitchens direct make made to measure fitted and freestanding kitchens at great value for money! 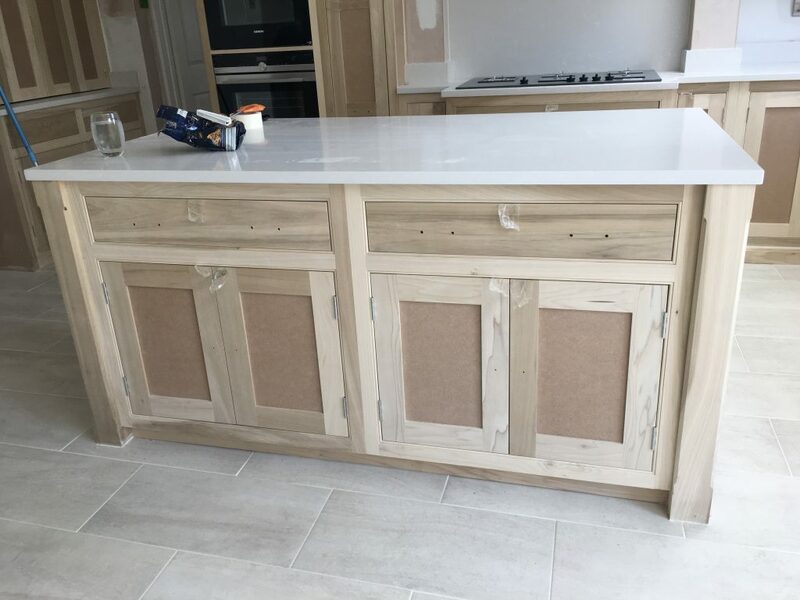 With over 200 fitted cabinets, made to any height and width, you can mix and match the fitted with the freestanding pieces. They also have a large variety of wood pieces to choose from… and provide a nationwide delivery service. They are supplied unpainted so you can finish them in any way and colour you like. A great example of a Handmade kitchens direct kitchen, professionally spray painted in High Wycombe by Lindsay. Why? You can just paint it yourself, right? Of course… there is no reason why you can’t; decent brush, some primer and a tin of DIY furniture paint and off you go… You’ve made a great value purchase from handmade kitchens direct so why spend extra money having it professionally painted? Creative Chic specialist kitchen painters have years of experience, painting high-end bespoke kitchens for many of the countries leading manufacturers; our kitchen painters have the skill set, the knowledge, the expertise and access to the most successful and reliable paint systems in the business. Choose one of our specialist kitchen painters to paint your new great value kitchen and your family and friends will be like… OMG! How much did that cost? Is it a Tom Howley Kitchen? Incidentally Tom Howley type kitchens start at around 45K!!! Dont make a pigs ear out of a potential silk purse! 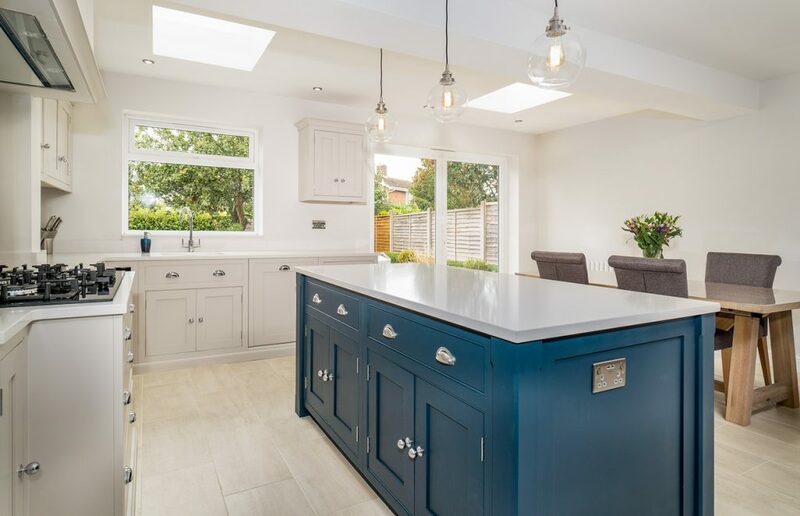 Our specialist kitchen painters will discuss colour options with you and help you decide which colours work best with your kitchen layout, surroundings, natural light sources and lighting you have in place. They will prepare your kitchen meticulously: all work-surfaces and flooring will be masked off and protected. All hardware will be removed… the doors and draws will be removed where necessary. HPKUK specialist kitchen painters use the very best materials available in creating your beautiful new kitchen. You can choose from a 10%to a 30%mid sheen level finish, with a colour palette only limited by your imagination. 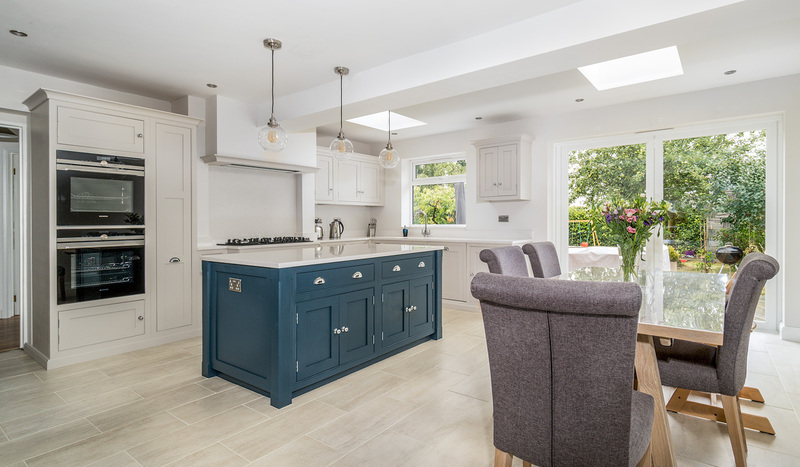 The kitchen featured was finished in equivalent colours to Farrow and Ball “Hauge Blue”on the Island and “Cornforth white”on the main kitchen cabinets. Many of our specialist kitchen painters can spray a kitchen both on site or take the removable items, such as the kitchen cupboards, away to be sprayed within their own factory location. After purchasing our unpainted wooden handmade kitchens direct kitchen, we set about finding out how to paint it. Once we began investigating everything required, it became clear that the specialist expertise, tools and space required meant that doing it ourselves would mean not making the most of our investment. We contacted HPKUK and were quickly put in touch with Lindsay. She had great advice on colours and finishes and we are thrilled with the end result. We are now looking forward to enjoying our new spray painted kitchen for years to come. 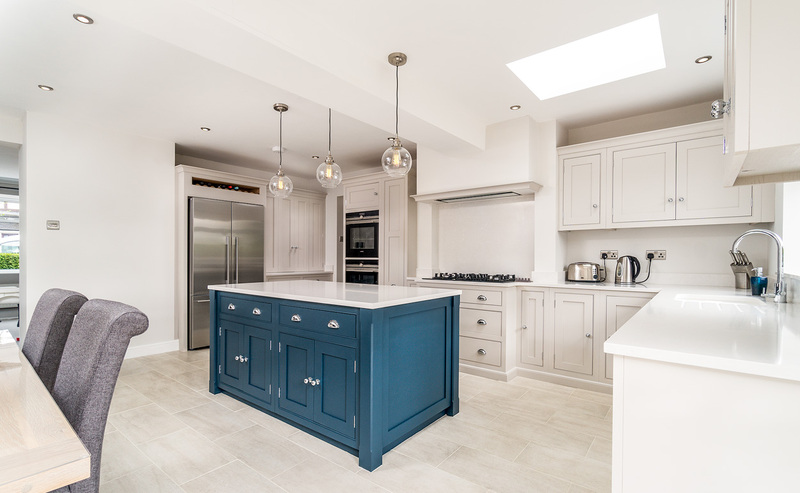 Our team of kitchen painters work hard to make your kitchen dream a reality, taking new unpainted handmade kitchens, previously painted kitchens or tired old cabinets and drawers, and transforming them into showroom quality pieces. Their beautiful work can be found in homes across the nation and we have more examples to show you. 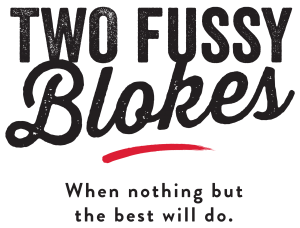 Whether it’s a sprayed kitchen or a hand painted kitchen, the choice is ultimately yours. For more information and to speak with our specialist kitchen painter Lindsay contact Creative Chic today. We will be more than happy to discuss your requirements.